Sam Nicholson handed Hearts a winning return to Scotland's top flight after a seven-goal thriller with St Johnstone. Former Hearts defender Brad McKay helped them on their way, his slip allowing Juanma a fourth-minute opener. Jamie Walker followed up to extend the lead after Osman Sow's penalty was saved by Alan Mannus. Simon Lappin prodded in for Saints, Callum Paterson restored the advantage, but John Sutton and Graham Cummins replied before Nicholson's late winner. Those final three goals within five minutes provided a breathtaking finish to a day of celebration for Hearts, who had unfurled the Scottish Championship winners' flag before kick-off. Hearts had already started their season against Arbroath in the League Cup - a 4-2 victory achieved without their batch of summer signings being involved. The strength of the squad Robbie Neilson has assembled was unleashed on St Johnstone, with Blazej Augustyn handed his debut and Igor Rossi and Juanma given first starts among six changes to the starting line-up. Three weeks have passed since Saints started their season with an away goals defeat by Alashkert in Europa League qualifying, but that still wasn't long enough for Steven Anderson, Dave Mackay and Murray Davidson to recover from injury. Lappin and Chris Millar were fit enough for a return and McKay was back in defence among the five changes, but the self-confessed Hearts fan made a nightmare start against the club from which he was released in the summer. Under no pressure, the central defender stumbled as he looked to clear and Juanma strolled forward to fire under the exposed Mannus. The early goal did not force Saints manager Tommy Wright to waver from his promised positivity. It was fairly industrial, but the visitors' long balls to their two strikers were being more effective than the similar approach being adopted by Hearts. The Perth side's injury woes continued with the early loss of new captain Millar after an awkward challenge, but Scott Brown slotted in seamlessly as typically dogged Saints started to find a flow to their passing that had deserted them against Alashkert. Summer signing Joe Shaughnessy's long throws were causing palpitations in the heart of the home defence and goalkeeper Neil Alexander had to flap the ball clear off a goal-line from which Nicholson also athletically cleared a Sutton header. Juanma showed power and skill to burst clear from his half and find Nicholson, who went down following the slightest of touches from Mannus, and it looked like game over as Walker followed up to score after the goalkeeper parried Sow's spot kick. However, when Alexander flapped at a Shaughnessy long throw, Lappin prodded Saints back into the game. Paterson finished with aplomb after being played in by a superb Walker pass, but Saints fought back again as Sutton headed in from a David Wotherspoon cross and Graham Cummins prodded the equaliser as he made his debut from the bench. However, there was still time for Paterson's curling cross to be steered into the far corner by Nicholson. Match ends, Heart of Midlothian 4, St. Johnstone 3. Second Half ends, Heart of Midlothian 4, St. Johnstone 3. Attempt saved. Graham Cummins (St. Johnstone) header from the centre of the box is saved in the top centre of the goal. Substitution, Heart of Midlothian. Gavin Reilly replaces Osman Sow. Attempt missed. Graham Cummins (St. Johnstone) header from the centre of the box is high and wide to the left. Attempt saved. Jamie Walker (Heart of Midlothian) with an attempt from the centre of the box is saved in the centre of the goal. Substitution, St. Johnstone. Christopher Kane replaces David Wotherspoon. Attempt missed. David Wotherspoon (St. Johnstone) right footed shot from outside the box is close, but misses to the right. Blazej Augustyn (Heart of Midlothian) is shown the yellow card. Goal! Heart of Midlothian 4, St. Johnstone 3. Sam Nicholson (Heart of Midlothian) left footed shot from very close range to the bottom left corner. Assisted by Callum Paterson with a cross. Goal! Heart of Midlothian 3, St. Johnstone 3. Graham Cummins (St. Johnstone) right footed shot from the centre of the box to the bottom right corner. Substitution, Heart of Midlothian. Kevin McHattie replaces Juanma. Goal! 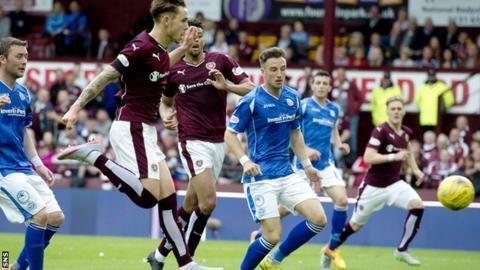 Heart of Midlothian 3, St. Johnstone 2. John Sutton (St. Johnstone) header from the centre of the box to the bottom left corner. Assisted by David Wotherspoon with a cross. Delay in match Alim Ozturk (Heart of Midlothian) because of an injury. Attempt missed. Morgaro Gomis (Heart of Midlothian) left footed shot from outside the box is high and wide to the left. Tam Scobbie (St. Johnstone) wins a free kick in the attacking half. Attempt missed. John Sutton (St. Johnstone) right footed shot from outside the box misses to the left. Morgaro Gomis (Heart of Midlothian) is shown the yellow card for a bad foul. Attempt missed. Sam Nicholson (Heart of Midlothian) left footed shot from the centre of the box is too high following a fast break. Attempt saved. David Wotherspoon (St. Johnstone) left footed shot from the right side of the box is saved in the top left corner. Goal! Heart of Midlothian 3, St. Johnstone 1. Callum Paterson (Heart of Midlothian) right footed shot from the centre of the box to the bottom right corner. Assisted by Jamie Walker.